Throughout the rest of this tutorial series, we'll focus on setting up React locally. The first of these approaches is similar to CodePen, where the React scripts were inserted dynamically into your HTML file, before being rendered in the output window. The only difference here is that we'll be inserting the scripts manually. Start by creating an index.html document and adding a couple of <script> tags for the React and ReactDOM libraries. The React scripts added are via a CDN, and the particular URIs are recommended by Facebook. If you want to work completely offline, you could download these scripts locally and change the links to be relative. An element <div id='app'> was added as the location in the DOM our React app will be rendered to. A blank <script> tag was also added, which will be used to add our React code shortly. Let's use the same React component from the CodePen example in part two of this tutorial series, so we can directly compare the two setup methods. 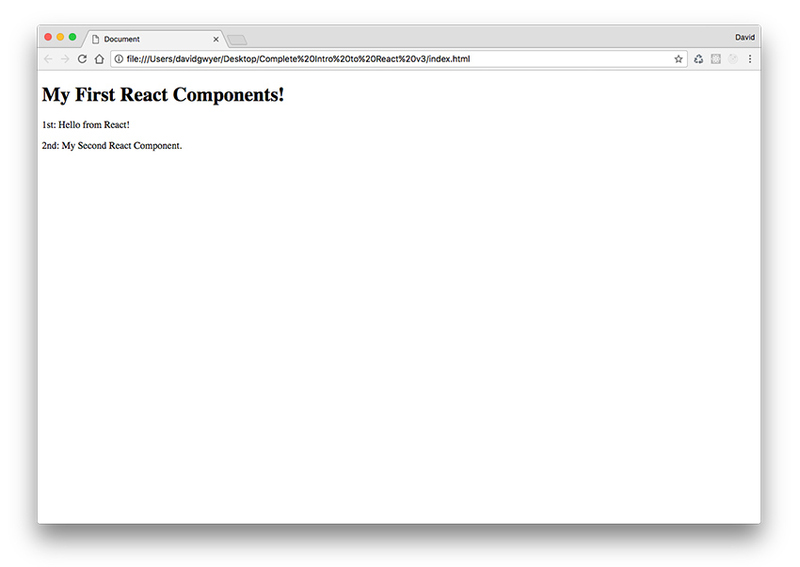 This is what a React component looks like without JSX. In fact, this is what the JSX code is actually compiled into by Babel. Let's now add the definitions for the two child components and add a reference to each of them in the top-level <App /> component. I'll also implement the number props from the CodePen example. Here's what the whole HTML source code now looks like. Open index.html in a browser to see the React output. I won't go into more details here about React.createElement(), and other non-JSX topics, as the majority of React users choose to write their components using JSX. 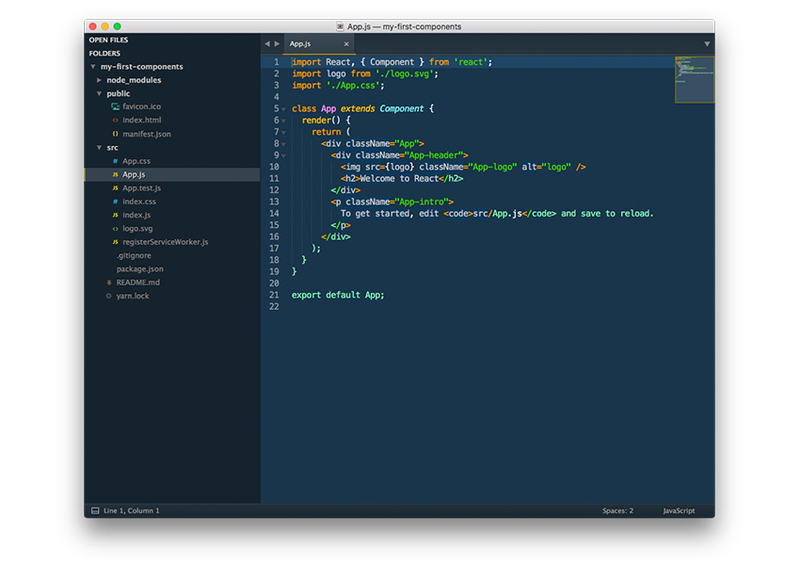 We'll be using JSX for our React components for the remainder of this tutorial series. To solve the problem of complex manual React setups, Facebook introduced create-react-app, which is a user-friendly way to get started developing with React. It provides you with full build setup but requires no manual configuration at all. Let's go ahead and install create-react-app. Type the following code in a command-line window. This will install create-react-app globally so you can access it from any directory. You'll need npm installed to run this command, and Node.js to run create-react-app. As npm comes bundled with Node.js, simply download and install the latest version of Node.js from the official website. 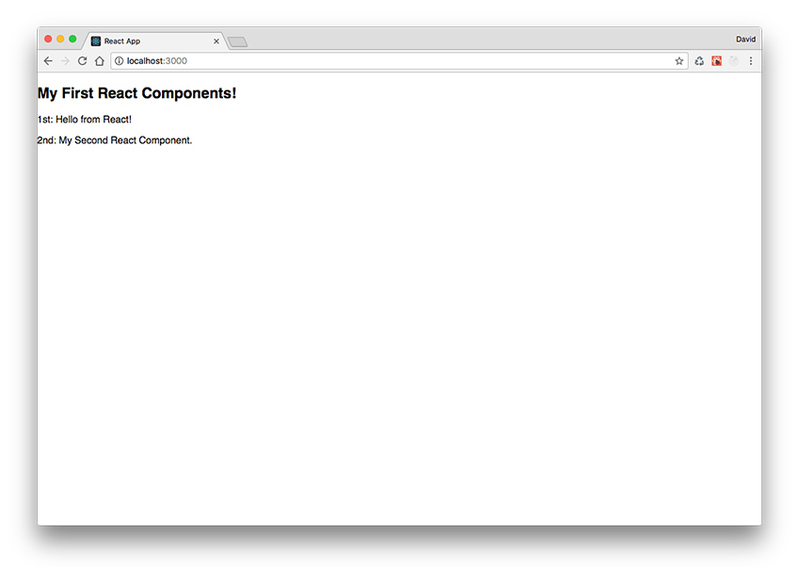 We'll now create a new React app called my-first-components. Note that create-react-app creates the containing folder for your app automatically, so you only need to make sure you're in the directory you want your app folder created in. Run these commands to create your app and run the start script. It might take a minute or two for create-react-app to complete installing everything. Once done, enter the npm start command and a new browser window will open and, after a few seconds, your React app will be displayed. The nice thing about create-react-app is that it includes a mini web server and also watches the files in your app for changes. Whenever a change is made, your app is rebuilt, and the browser window automatically reloads to display your updated app. To get a feel for how we create components and connect them together inside a create-react-app generated app, we'll create the same components that we have been working with so far. The default output of the app suggests we edit App.js as a starting point, so open this file and remove the import calls for the logo and CSS files as we won't be needing these. We can also simplify the <App /> component, and add in our two child components from before. Let's make this more modular, though, to be in line with modern best practices for creating React apps. Create two new files inside the src folder named MyFirstComponent.js and MySecondComponent.js. This approach to structuring your React app is much more modular and portable. It also allows for easier debugging as each component is self-contained inside its own module. 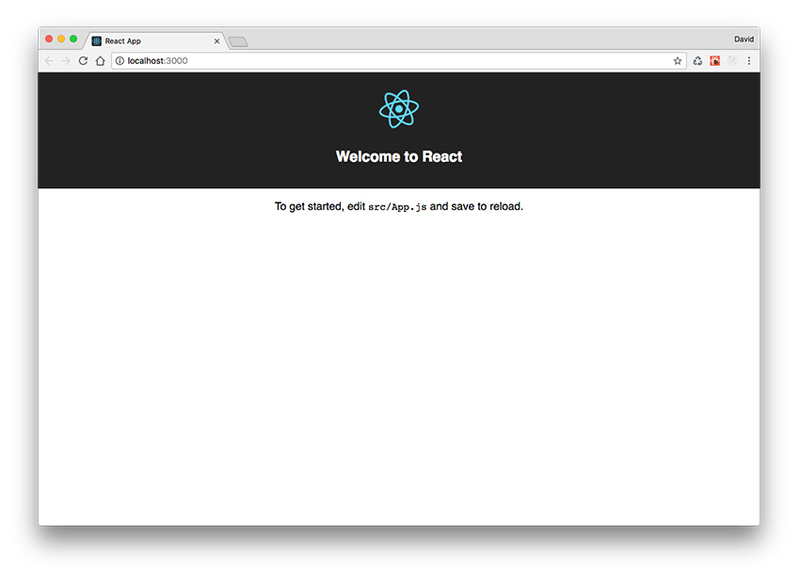 In this tutorial, we've covered two methods for setting up React locally: the manual approach, and using the create-react-app tool from Facebook. Creating a React app manually from scratch and inserting the script dependencies directly inside the index.html file is pretty inefficient. As your app scales, and as different versions of your scripts are released, manually updating the scripts will quickly become unmanageable. On top of that, we can't use ES6 features, or write our components in JSX! Using create-react-app, on the other hand, is a very smooth process. It's installed and initialized with a couple of commands. Once running, create-react-app rebuilds your app and updates the browser window every time you edit any project files. This is a really nice workflow when making a lot of minor changes, as it helps to speed up app development. Remember my personal information Notify me of follow-up comments? May 04 Getting Started With Redux: Why Redux? 11 months ago Melissa Perfect info, thanks! one year ago quito Hello. And Bye. 4 months ago krysty So how does it work? Is there a better method? 11 months ago martijn broeders Hello Cathern, Not at all. be my guest.